It’s been a “Beast of a day”, to quote this week’s Isles of Scilly Notes. Penzance cricket team home on the evening boat, the planned match “completely washed out”. Here on the mainland, it’s the Pirates’ first home match of the year, and my mission is to represent the action to our readers. This is my challenge: to represent, with the flair, knowledge and impartiality that the journalist’s calling demands, those players slogging up and down in the mud. The rain at least has given over – but now there’s fog coming in. If I was out at sea, perhaps off Cape Cornwall, I’d be worried. And as a reporter? Well, if I was out at Cape Cornwall, perhaps I’d be hopeful. The Pirates? They’re playing the Cornish Wanderers, “the team that provided such sparkling games last year”. And there are fears that – after the good start in last week’s away matches at Barnstaple and St Ives – things might not go so well for the Pirates tonight. The weather hasn’t helped, and to be frank the attendance can only be described as “quite good”. Quite Good Considering, you might say. And what’s more, two of the Pirates team that did such a good job in those early matches have upped and gone on holiday. The Penzance men have started off playing downhill, and there have been a few comments about the unkempt state of the grass at the bottom of the slope, the reporting of which will require a certain lightness of touch. Now some action: a forward rush, and some nice passing… but then, it has to be said, something of a fumble. Every battle has its casualties, and this is no exception. On the Wanderers side we have Hooper, forced by injury to leave the field of play; Rockett, victim to one of their own “characteristic rushes” but able to play on after treatment. For Penzance Jack Harwood, playing forward, sustains “a nasty cut over the eye” which forces him off the field for “attention”. Jennings of the Wanderers – he’s the man to watch. 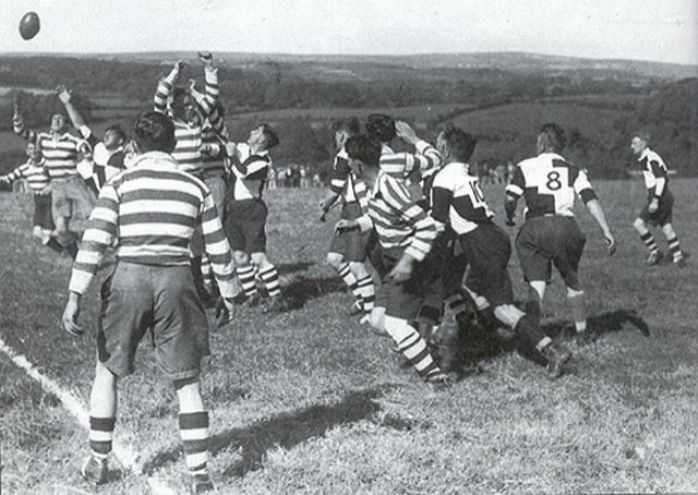 Whether dribbling, converting or “finding touch”, it has been impossible - from the Cornishman’s favourite viewpoint in the stand - to find fault with either the man or his sporting prowess. It starts with “a nice run”, the clearing of a “forward rush”, but it doesn’t end there. “JENNINGS converted…. Penzance attacked again, but Jennings sent them back to half way”, we will note. “Again Jennings got away”, we will report, “and started a dangerous movement”, and although in that instance we can add “smart tackling saved the situation”, and shortly “the Penzance forwards took play to the visiting 25”, the refrain will later be taken up once more: “Jennings kicked fine touch, sending them back again….. The Wanderers exerted pressure, and JENNINGS, after a lovely swerving run..… JENNINGS to convert and put them ahead”. But Penzance folk may rest easy in their beds tonight for, as you will read, the home team have prevailed in the end despite rain, injury and Jennings. The final result – and a fine one, I think you’ll agree, achieved against the odds: Penzance 27 points, Wanderers 15. And so to bed – for after all, what else is there to do on a wet Monday night in West Cornwall? Mrs Morton Nance telling the Madron Women’s Institute about her holiday in Brittany? Long Rock defeating Penzance Harlequins at Association football, even though “several” of their players “failed to appear”? Harvest Thanksgiving at St Just? All very nice, I’m sure, but I’ll plump for the Rugby against any of those. Although what I’m really hoping for tomorrow is a ship aground by morning with a great hole in its side, everyone out on the cliff to watch developments, no loss of life, and a passenger keen to tell us his story in return for a lunch at the Commercial Hotel. Cornishman 15th September 1932 – main story page 6, see also pages 2, 4, 8 and 9. As readers may have guessed, our journalist’s hoped-for story would actually unfold the following day, just as described.